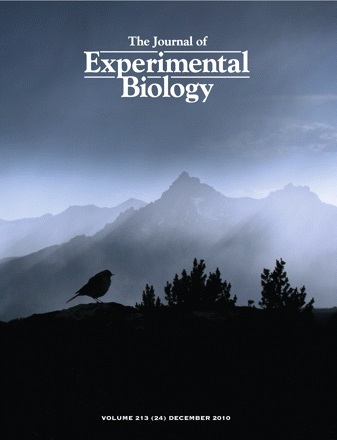 On the cover: An American pipit (Anthus rubescens) silhouetted against the Beartooth Mountains of Montana, USA. On page 4125-4136 of this issue, J. F. Storz, G. R. Scott and Z. A. Cheviron review mechanisms of adaptation and acclimatization to high-altitude hypoxia in vertebrates. They conclude that, in birds and mammals, the acclimatization response to environmental hypoxia sometimes represents a form of maladaptive phenotypic plasticity. Thus, blunted erythropoietic and pulmonary vasoconstriction responses to hypoxia may often represent genetically based adaptations that counteract the plastic response. Storz, J. F., G. R. Scott, and Z. A. Cheviron. 2010. Phenotypic plasticity and genetic adaptation to high-altitude hypoxia in vertebrates. Journal of Experimental Biology 213(24), pp. 4125-4136. Jay Storz is a Susan J. Rosowski Associate Professor in the School of Biological Sciences.